A report written by a government agency dedicated to Digital Affairs for the French Ministry of Labor recommends experimenting with an unconditional basic income to cope with the fundamental transformations of work in the context of the growing digital economy. How do automation and digitalization of activities impact working conditions? This was one of the key questions the National Digital Council was tasked to address in a report sponsored by the French Ministry of Labor and Social Dialogue. The Digital Council is a public agency created in 2012 to advise the French government on matters related to the digital world. The report was released earlier this week – see the full report here. It makes an important case for basic income, and calls for a thorough appraisal of “the various proposals and experiments around basic income”. Basic income is part of the twenty main recommendations contained in the report. The Minister of Labor Myriam El Khomri was not so enthusiastic but did not close the door on the idea: “I do not want to dismiss it, but at first sight I am not sure about its cost,” she said. According to the report, the existing social protection model has been pushed to its limits, and the labor market has failed to reward many different forms of activities, and thus provide an income to everyone. These phenomena are not new, but technology is accelerating the trends. Automation is displacing jobs and killing aggregate demand in the economy. The development of invisible forms of production on the internet – what is commonly referred to as ‘digital labor’ – is leading to new forms of production that do not remunerate people for their work. As a consequence, there is a need for new kinds of redistribution systems, such as a basic income. The report reviews many common arguments for introducing an unconditional and universal basic income, and quickly sketches different proposals on how to implement it. These include a reform of the tax-benefit system, various forms of money creation (such as quantitative easing for people), and raising corporate taxes to remunerate invisible and unpaid labor. A feasibility study on basic income to be conducted by a team of economists, statisticians, fiscal and legal experts. The aim would be to develop a simulation tool of the transition to a basic income, and carry out an impact assessment of each proposal in the public debate. Local basic income experiments that complement the feasibility study and consider various scenarios. Basic income was only the last of 20 recommendations, yet it made most of the headlines in French media. The French Movement for Basic Income, a BIEN affiliate, was among the organisations consulted during the writing process and welcomed the release of the report. “It is a timely report that opens the debate in the best possible terms,” International Coordinator Nicole Teke said to BIEN. 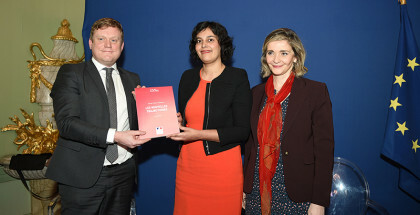 The French government has commissioned another report to review all social benefits, with special attention to be paid to the existing minimum income scheme. The French Movement for Basic Income announced that it will submit proposals to pave the way for the introduction of a basic income. Nice, hope there will be some large scale basic income experiments in some EU countries, the only way to prove if it is working or not ! Does anyone know if there is an English version of the report? I support a universal basic income. Thank you for posting this article.